STATEN ISLAND, New York — SILIVE.com reports that one person suffered injuries in a car accident on the Verrazzano-Narrows Bridge. The incident happened on the Brooklyn side of the span in the eastbound, or Brooklyn-bound lanes. The report filed by SILIVE.com correspondents did not explain how many vehicles may have been involved in the crash. The report did indicate that traffic delays caused by the crash were lengthy and authorities advised travelers to seek alternate routes around the traffic jam eastbound. A spokesperson speaking on behalf of the Fire Department of New York reported that the motor vehicle crash caused at least one person to require treatment at a local hospital. The FDNY spokesperson told SILIVE.com that the injured motorist received emergency transportation to NYU Langone Medical Center. The facility is located in Brooklyn. The FDNY spokesperson refused to provide any details about the nature of the person’s injuries or the individual’s identity. The crash reportedly caused severe delays according to local traffic monitors. No other information was available. 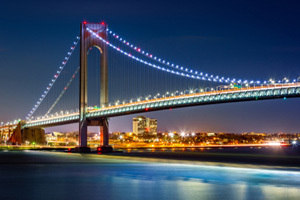 The Verrazzano-Narrows Bridge is a heavily traveled road in New York, and accidents happen on the Bridge on an almost daily basis. So many crashes happen on the Verrazzano-Narrows bridge and on the roads leading into it and off of it that people almost fail to take notice of the severity of the crash and the possible consequences the accident has on the participants. People are more concerned about the amount of traffic in the area. Motorists in the New York metropolitan area must be vigilant about driving defensively and focusing on safety to avoid an accident. But, if you or a loved one was unfortunate enough to suffer injuries in a New York accident, New York law allows the victim to recover monetary damages for the past, present, and future medical losses, financial losses, and pain and suffering. Have you or a member of your family been injured in an accident?